Team websites are optional. If a team chooses to build a team website, we recommend using Shutterfly's Team Sites platform. The Shutterfly system is FREE, user friendly, backed by great support, and packed with more features than we can offer through Odyssey's website. IMPORTANT: Please review the screenshots below for important settings to pay attention to when setting up your page. By default, Shutterfly's team websites are set to private, meaning only the people you add as members can view the site. 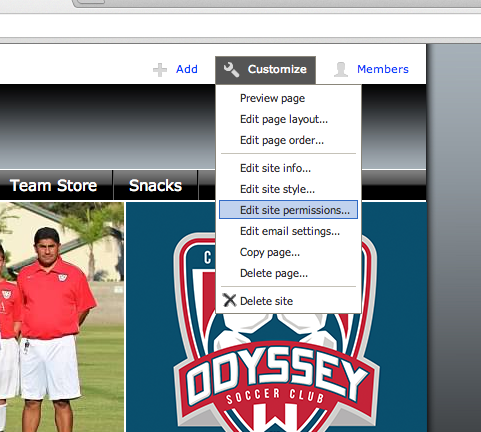 If you want your site to be public and viewable by anyone you need to set your permissions accordingly. Below are a few variations of our club logo for you to use in the design of your Team Site. Simply right click on the images and choose "Save Image" to download the imges to your computer.